1 months warranty $165 including GST. This for the budget minded client and is a great price with similar treatment as the Silver and Gold levels of service. Add $85 for pantry moth control if done at same same. Add $110 for termite inspection or rodent control if done at same same. 3 to 6 months warranty $185 including GST. This level you will get more pests covered and some extra cockroach baits. Add $85 for pantry moth control if done at same same. Add $110 for termite inspection or rodent control if done at same same. 6 to 12 months warranty $250 including GST. This is our premium and most chosen level of service. You will get more pests covered and some extra cockroach baits + extra ant baits and we just go the extra mile to ensure that you remain pest free with most of the pests that bug you! Add $85 for pantry moth control if done at same same. Add $110 for termite inspection or rodent control if done at same same. Add $110 for termite inspection or rodent control if done at same same. Tick control is quoted at $330 including GST. Unconditional 6 month warranty with winter bookings heavily discounted. For the very best protection of your home or office, it is recommended to get it done every 6 months and it is strongly recommended to do it every 12 months. If you are unsure of what to expect from a pest control treatment for a general spray below is some good info on what to expect from A1 Pest Control, what to do before we come, and what do to after we leave as well as how we carry out the treatment. Have a read through and ring us up if you have any further questions regarding the treatment or insecticides used. If you’ve had treatments done in the past and find that they haven’t been as thorough as ours then why not give us a ring and we’ll solve your pest problem. 1. We have over 35 years of experience. 3. Your safety is assured, as we only use the safest insecticides. 4. We are on time, and have very good communication skills. 5. We are fully licensed with Advanced Termite Control Accreditation and Certificate IV in Urban Pest Management. (Most licensed pesties only have Cert III). 6. You will not be forgotten or ignored!We send you reminders via text and email. 7. We service our warranties with a smile. We use low and non toxic insecticides safe for kids and pets. WHAT should I expect from a General Pest Treatment? – it usually takes 1 hour to do the treatment from arrival to finish. Only non-toxic sticky-baits and low toxic insecticides such as pyrethrins and synthetic pyrethroids are used for your safety and our technicians safety. Feel free to ask us for MSD sheets and examine the labels over any insecticidal product we use. – we use an air pressured spray tank to spray the entire perimeter of the property inside and outside, we are very cautious and tidy. – we use a dust blower machine to blow a white dust into the roof void to flush and kill all the pests housing in the roof. – we use a white cockroach gel as a bait placed on the hinges of the kitchen cupboards, since cockroaches are cannibals. – when one eats the bait the other ones from the community also get infected by eating the dead ones. – we give you and explain how to use the extra baits for a lasting outcome of our treatment. – it would be really helpful to have all small items removed from the edges such as shoes, clothes and etc. – if there is heavier furniture, you don’t need to worry about it we can go around it. – if there are kids toys make sure they are stored or covered by a plastic. – if you can, leave the house for a couple of hours during and after the treatment. – it is best to put away any dishes or food laying around the kitchen as well as fruits on the bench. – if there is an aquarium, make sure it is well covered and unplugged while the treatment is being carried. – if possible, vacuum the corners and behind furniture for a better application. What do I need to do AFTER the technician leaves? 1. Wait for the insecticide to dry, it usually takes about 1 hour depending on the weather. 2. Don’t mop the edges of the floor for about 15 days. 3. Use the ant gel baits if seeing ants around. We are available from short notice. Thanks again and we will do a great job for you! 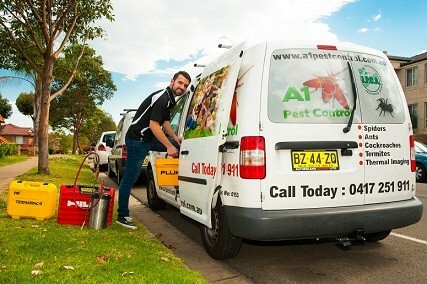 Call 0417 251 911 to book your treatment or email bruce@a1pestcontrol.com.au for extra information.